I have started uploading photos from Stinson Beach. Slowly as I am having network troubles on one computer. However, the full moon shots have made it. Wednesday evening we drove back from Olema and the fog has finally dissapated and there she was. A glorious almost full moon up over us all the way home. 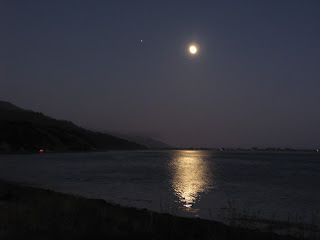 We stopped when we got to Bolinas Lagoon and I took several shots on manual mode. There was a post with a sign on it I used as a tripod. Not too shabby.